last time, i shared my best satin stitch tips. did you try them? how are your satin stitches coming out? if you're just not that into satin stitch, you are not alone. and you're in luck! because there are so many other great stitches that you can use to fill your embroidery designs. 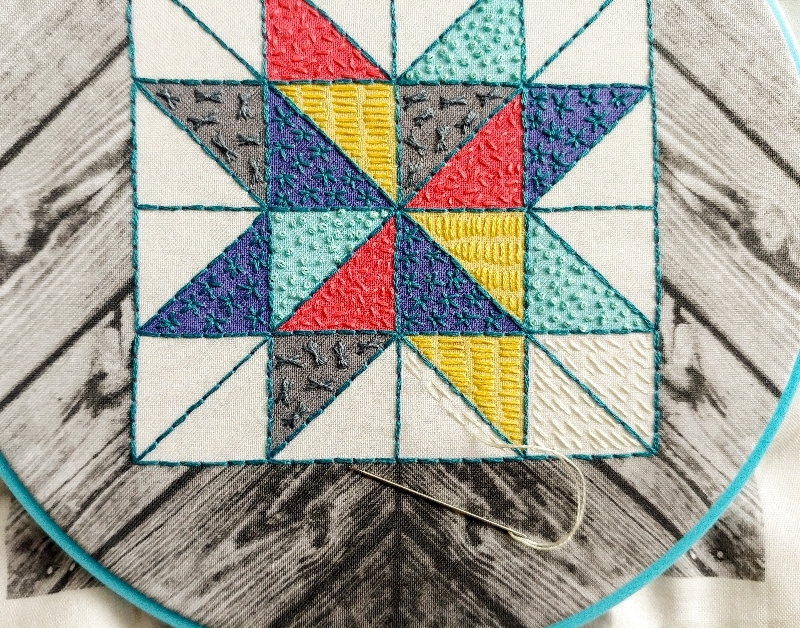 i'm stitching two versions of the barn quilt design. in my second hoop, i used back stitches (3 strands) to outline all of the triangles. then i filled in each color with a different stitch. i used a handful of very basic stitches here, 2 strands of floss for them all. off-white: slightly crooked rows of running stitch. purposefully imperfect. as i have said before (and will no doubt say again), there really are SO many options, and embroidery designs can be interpreted in many ways. think outside the box and remember to have fun and be creative with the way you approach your stitching.